Knowing you're protected in both your home and while on-the-go may be just enough to keep you at ease. 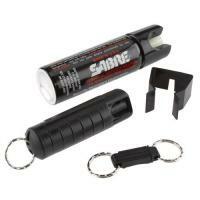 The Sabre 3-In-1 CS Gas and UV Dye Home Away Protection Spray Kit offers at home protection in the event of a home invasion and on-the-go protection for the unpredictable while you're out. The home unit comes in a 2.5 ounce canister and has a wall mount to keep it out of reach from children. This unit delivers a cone-shaped spray, increasing the overall impact of the spray on your intended target. The glow-in-the-dark feature conveniently helps you locate the kit when lighting is low or nonexistent. You're at home spray kit has a effective range up to 10 feet. The away pepper spray comes in a portable .54 ounce keychain canister that hooks to your key ring and delivers a ballistic spray stream up to 10 feet.